Applications Drinking fountains, bubblers, water coolers, humidifiers, beverage dispensers, spray paint rigs, air tools, etc. For air, water, oil, fluids, and gas applications. Intended for use on equipment requiring moderate regulation, low to medium capacity, and installations where space limitations and flexibility of hook-up are important factors. They are designed for initial pressures up to 250 psi and delivery pressures ranging from 2 to 180 psi depending on the spring used. Maximum temperature 180°F (82°C). Applications Drinking fountains, bubblers, water coolers, humidifiers, beverage dispensers, spray paint rigs, air tools, etc. For water, air, light oil. Reduces high pressure to lower outlet pressure within close limits. Good for inlet pressures up to 300 psi. Maximum temperature 180°F (82°C). Applications Mobile homes and recreational trailers. This modified regulator is specially designed for mobile homes and recreational trailer installations where space limitations are important and relatively low capacity is required. Applications Recommended for regulating the flow of air, oils, gases and all non-corrosive fluids. Not for use on steam. The A-360 and A-361 incorporate an aspirating action to give exceptionally good regulation at high flow rates. Maximum initial pressure, 400 psi. Maximum delivery pressure, 175 psi. Maximum temperature, 180° F (82°C). Type A-360 has one inlet and one outlet; furnished with forged brass body. Type A-361 is designed for 3-way or 4-way use. One inlet, three outlets. Gauge tappings 1/4" NPT; cast bronze body. Type A-365 is designed for a maximum inlet pressure of 1,100 psi, while allowing for delivery pressures to be adjusted from 0 to 250 psi. Sizes 1/4" and 3/8" only. Applications Water, air, light oil: spray equipment, dishwashers, air tanks, food, chemical and industrial process lines. Steam: unit heater, pressing irons, steam cookers, degreasers, sterilizers, vulcanizers. Sizes 1/4", 3/8", 1/2", 3/4", 1", 1 1/4", 1 1/2", 2" on NPT or BSPP Threads. Automatically maintains, within close limits, the desired reduced pressure in the service line. Threaded connections. 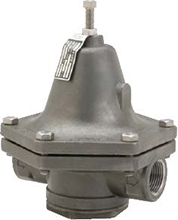 Iron body valves are for initial pressures up to 200 psi on water, air, oil, or other liquids, and for initial pressures up to 150 psi on steam. Maximum delivery pressure in all cases is 125 psi. 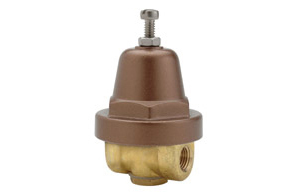 Bronze body valves are for initial pressures up to 400 psi on water, air, oil, etc. and for pressures up to 250 psi on steam. Maximum delivery pressure 150 psi. Teflon® Seat available for temperatures to 350° maximum on steam. Applications Suitable for almost any service. Water, air, light oil, steam: suitable for chemical, food, pulp and paper industry, utility lines, and specialist OEM applications. Cryogenic: suitable for liquid or gas phase in the pressure build circuit of cryogenic storage tanks. Sizes 1/2", 3/4", 1" in NPT or BSPP Threads. Automatically maintains, within close limits, the desired reduced pressure in the service line. Threaded connections. Investment cast carbon steel and stainless steel bodies, chambers and bottom plug, with stainless steel trim and a choice of metal-to-metal, Teflon® or BUNA-N-seating. Initial pressure up to 720 psig, reduced pressures up to 400 psig and the operating temperature range is -320°F to +450°F depending on the trim options. Applications Intended for Heavy Oil Service (Bunker C and other grades), dirty liquids, high viscosity fluids. Sizes 3/8", 1/2", 3/4", 1", 1 1/4", 1 1/2"
Direct-acting, single-seat, spring-loaded diaphragm. Maintains lower pressure within reasonably close limits. Iron or bronze bodies, threaded connections, Monel® or BUNA-N diaphragm. Stainless steel piston and seat, both of which are renewable. Standard valve equipped with square head adjusting screw. Maximum initial pressure in iron, 200 psi; maximum reduced pressure, 125 psi. In bronze, maximum initial pressure, 400 psi; maximum reduced pressure, 200 psi. Direct-acting, single-seated, spring-loaded diaphragm. Maintains lower pressure within reasonably close limits. Cast in gray iron. Threaded connections, Monel® diaphragm, stainless steel piston, seat, pusher post button, iron bottom plug. Piston seat and body seat are easily renewable. Rustproof steel bolting. Maximum initial pressure, 200 psi; maximum reduced pressure, 125 psi. Applications All types of water systems; various pneumatic, cryogenic and hydraulic systems, etc. Sizes 1/2", 3/4", 1", 1 1/4", 1 1/2", 2" in NPT and BSPT threads. Aspirated design for close pressure control. Handles high and variable flow rates well beyond the limitations of ordinary regulators. Bronze body with stainless steel body seat. Brass built in strainer is easily removed for cleaning. Maximum initial pressure, 400 psi. Delivery pressure: maximum 300 psi; minimum 25 psi. Maximum temperature 180°F (82°C). Applications Steam heating lines, dryers, ovens, sterilizers, oil heaters, steam jacketed equipment etc. and any other steam, air and gaseous application. Sizes 1/2", 3/4", 1", 1 1/4", 1 1/2", 2" threaded. 2 1/2", 3", 4", 5", 6" CL125 flange. Self-actuated pilot operated pressure reducing valve providing very high capacity with less <1 psi fall-off. It is very compact in design, offers positive shut-off and is available in iron, bronze, cast and stainless steel for pressures up to 600 psi inlet, between 1 and 300 psi outlet and temperatures up to 800°F. Stainless steel seats are used for steam, and where a tighter shut-off is required for air and gases, BUNA-N and TFE® seats are used. Also may be modified for oxygen gas service. Applications Dryers, steam atomizing oil burners, plastic molding, cookers, degreasers, sterilizers. Also, liquid or gas cryogenic service. Sizes 1/4", 3/8", 1/2", 3/4", 1", 1 1/4", 1 1/2"
Self-contained, self-actuated, threaded connections. Produces exceptional control with high capacity. Its design offers a wide range of adjustment and exceptional sensitivity of control. Applications Designed for use on air, water, light oil, oxygen, carbon dioxide and other gases and fluids. Single-seated, spring-loaded, direct-acting diaphragm type regulator. Maintains reduced pressure within reasonably close limits regardless of inlet fluctuations. Maximum initial pressure up to 2,400 psi. Delivery pressure: maximum, 500 psi; minimum, 40 psi. Bronze body, spring chamber and bottom plug; stainless steel piston/piston assemblies, cylinders, seat ring and strainer screens; BUNA-N diaphragm and O-rings. Self-renewable seat ring may be flipped over and reinstalled rather than replaced.